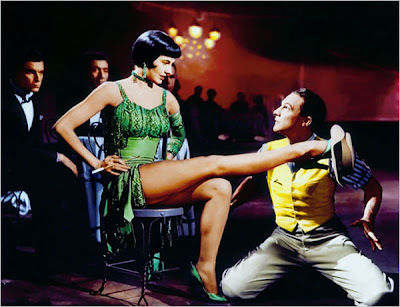 This week, we lost a legend when the amazingly versatile, witty, and gorgeous Cyd Charisse passed away. 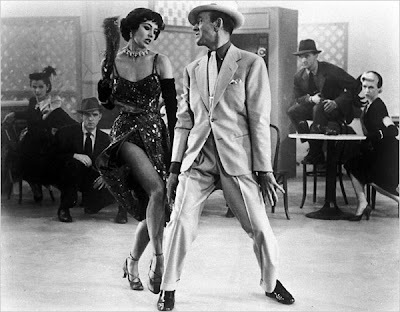 Always labeled as having "legs a mile long," despite being deceptively shorter than one would assume, she was the ultimate icon for tall women with the courage we only wished we had and the grace that only the chosen, gifted few like Charisse posessed in spades, whether it was bending Fred Astaire to her will in The Band Wagon (above) or tantalizing Gene Kelly so that he didn't know what hit him in the film that launched her, Singin' in the Rain (below). Whatever it was-- Ms. Charisse definitely had "it"-- that quality that makes or breaks a performer in solidifying their place as one of Hollywood's brightest stars. While she will greatly be missed, as not only a film buff but one with a definite weakness for musicals, the only way I could see fit to pay tribute to Ms. Charisse was by posting two clips from the aforementioned films to highlight her tremendous talent. I think you'll agree that they haven't lost their ability to awe more than fifty years later. Click here to view the Film Intuition Video Clips on our Home Page this week and also be sure to browse the rest of the site for updated reviews, trailers, clips, and a fun new video of the week on Jen's P.O.V. page certain to put a smile on your face, courtesy of director Spike Jonze.